"If change is not delivered now, then when will it happen?” This was just one of the messages delivered at Balancing the Boat: growing female participation and developing pathways in competitive sailing, the first of two open forums at World Sailing's 2017 Annual Conference in Puerto Vallarta, Mexico. On the current leg of the Volvo Ocean Race, every boat has a female sailor on the boat and at the Tokyo 2020 Olympic Games there will be a 50/50 split of male and female sailors. However, the consensus amongst the leading influencers speaking at Balancing the Boat was that more work can be and needs to be done. Hosted by sailing broadcaster, Alec Wilkinson, Balancing the Boat strived to seek solutions and set long term targets for positive change to be brought about. With equality in sport and sailing a leading topic of conversation in the community at the moment, the forum was well attended with committee members and delegates joining the debate. In addition, the conference was streamed online and those watching at home were able to engage in the conversation using #UnitingTheSport on social media. Unable to join the speakers in attendance, Emma Westmacott, a sailor of more than 30-years' experience with four round the world campaigns under her belt, delivered a strong message via video link. "The future of the sport really is at risk without attracting everybody,” she expressed. "The world at the moment is recognising the needs for gender equality. The world at the moment is recognising the need for diversity and equality throughout, for all minorities. "We need to change the willingness, we need to change the perception of what a female sailor means and looks like and how useful they are on a boat. Libby Greenhalgh competed on the last Volvo Ocean Race on-board Team SCA. She now acts as Director of Operations at the Magenta Project. Greenhalgh explained the importance of creating a clear message, getting everyone behind it and using it globally at all levels. "There are four key discussion points,” explained Greenhalgh, "from rules and incentives, to building a network, initiatives and just raising the visibility of female sailors so people can be inspired by what women are already achieving. Greenhalgh concluded by outlining the Magenta Project's three-year outcome goals. These included having two female led race teams in the Volvo Ocean Race and World Match Racing Tour, having a woman on every Youth America's Cup team and increasing participation at mass participation, national race weeks. New Zealand's Jo Aleh had targeted following in Greenhalgh's footsteps by racing in the 2017-18 edition of the Volvo Ocean Race. Aleh, a two-time Olympic medallist and 2013 Rolex World Sailor of the Year, explained the struggles she went through in obtaining a place on a team. 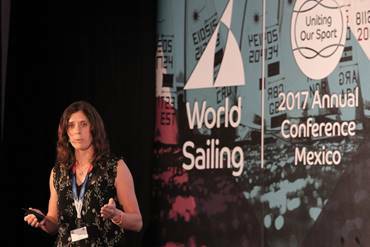 Greek sailor, Sofia Bekatorou, a two-time Olympic medallist and two-time Rolex World Sailor of the Year gave the audience an insight into her career in sailing. Finally, to give a perspective from another sport, Joe Jacobi (USA), former CEO of USA Canoe/Kayak shared his experience of creating a high-performance system in Oklahoma and the benefits it had on the community at large. 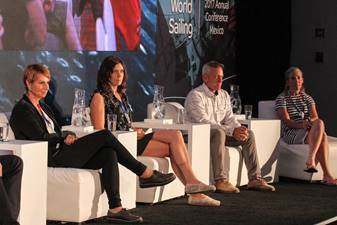 World Sailing Chief Executive Officer Andy Hunt joined the panel for a question and answer session, which concluded the session.